Top Photo: district manager Heidi Rausch and assistant bank manager Chris Ashburn with American Legion Post 6 in Stevens Point. Bottom Photo: Colleagues Jeff Coleman, Becky Tulius, Sherri Reynertson, Lauren Weisz and Kristin Haas with American Legion Post 92 in Rochester. Associated Bank branches across the footprint have been making donations to their local American Legion Post to show support for veterans. The effort dates back to November where Associated Bank branches displayed photos and military mementos in their lobbies to honor our country’s veterans and active-duty military personnel around Veteran’s Day. Items were borrowed from the American Legion Post as well as community members wanting to contribute to the displays. Check presentations were held with the corresponding American Legion Post chapters throughout March and April. 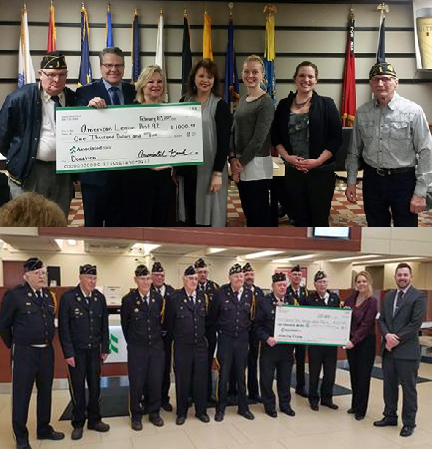 “It was an honor to be able to share the appreciation we have for our veterans, while learning more about the organization and its members,” said district manager Heidi Rausch, Associated Bank, Stevens Point. The American Legion is the nation’s largest wartime veteran’s service organization, committed to mentoring youth and sponsorship of wholesome programs in our communities, advocating patriotism and honor, promoting strong national security and continued devotion to our fellow service members and veterans. The American Legion’s success depends entirely on active membership, participation and volunteerism. This was the fourth year Associated Bank held this event. Associated Bank is committed to supporting veterans and military personnel within our business as well as our communities. View more about our veteran and military benefits at http://careers.associatedbank.com/veteransandinstructions.aspx.